What are the two most popular methods when applying for a SBR stamp? Trust is a legal entity and as such can legally own assets. One of the most popular methods for getting a NFA stamp is using a trust for a couple reasons. Depending on the trust you select and it’s legal language the process of inheritance of NFA items can be considerably easier. A trust can provide the ability for the control to move to another person without actual ownership the of the item changing. Another benefit if you select a trust with the ability to add/remove co-trustees is you can allow other individuals to posses the same NFA items without you present. Individual just as it sounds means you file the for the stamp in your own name and you are the sole owner of said NFA item. This also means you as the individual approved for the stamp are the only own that can solely be in possession. Others can use your NFA items but only if you are present. In the event you pass away, and a valid will is in place, your heir can request a tax exempt transfer of the NFA item into their possession. How should I name my new trust? The only naming requirements are the trust name must end in the word “TRUST”. You can literally name it anything you want. The only recommendation is keep the name short as possible. Reason being your trust name, along with your city and state where your trust is located, will need to be engraved on any Form 1 manufactured SBR. If your trust name is long you have less possible locations for the engraving as it takes up more space. What Info is needed for filling out a Form 1 to create a SBR? Should I use electronic file or paper file for my Form 1? Electronic (or eForm/eFile) has some distinct advantages. At the the you submit the form online you are charged immediately and can pay via credit card. Approvals via electronic are slightly faster, especially with delivery of your approved paperwork. In the case of electronic you will immediately get an e-mail with the Form 1 stamp attached once approved. Paper file is still very popular. One distinct advantage of paper file is the ability to make some corrections to the form after review by the examiner. Whereas with electronic any error results in an immediate disapproved and you start over. Can the firearm stay in my possession while I wait for my Form 1 to be approved? Unlike Form 4 where you are requesting approval to transfer an already created SBR which has to remain with the dealer until approved. 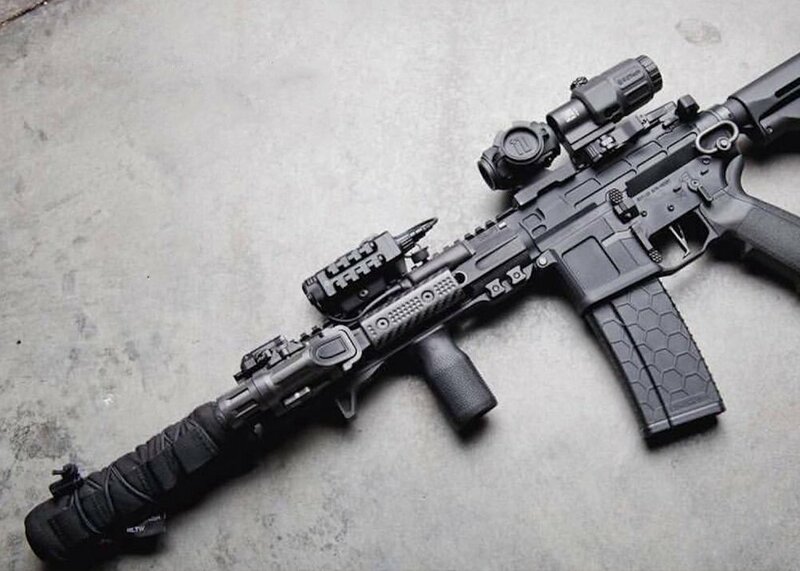 Form 1 you are not transferring a SBR, but instead asking for permission to manufacture one. This means while you wait for approval the firearm, still in title 1 configuration, can remain in your possession until your Form 1 is approved. I have my approved Form 1 stamp from the ATF, what is next? Update your trust’s Schedule A listing the new SBR as an asset (Original Manufacturer, Country of Origin, Model Number, and Serial Number). Next you need to engrave trust info on your firearm as new manufacturer along with city and state where the trust is located (per your trust document). Finally you can legally manufacturer you new SBR. Is engraving required? What are legal locations for engraving the trust info? Yes, engraving the new manufacturer on the firearm is absolutely required by the ATF. Engraving can be in plastic or metal along as it is at least .003” min depth and 1/16” min print size. The complete trust name along with the city and state the trust is located must be included in the engraving. Trust info can be engraved on the frame, receiver, or barrel. The receiver is the most popular location because any changes to the other components would not require the engraving to be repeated. What about switching calibers and/or barrel length after my Form 1 stamp is approved? Your Form 1 was approved for a specific caliber, overall length, and barrel length. However you are allowed to “temporarily” change the upper length or caliber but only if you maintain the original upper and ability switch back afterward. If you sell the upper and switch permanently to a different upper then you would need to send a notification to the ATF letting them know of the official change. You don’t pay the stamp or go through the Form 1 process again, just a notification. Can I travel both within my state and across sate lines with my SBR? You are free to travel with your SBR within the same state as you reside. When traveling out of state first and foremost understand the laws of the state you are traveling. If local state residents can not posses a SBR then you as a visitor can not either. Before traveling across state lines with your SBR you need to submit a Form 5320.20 to the ATF and wait for approval. This form does not cost anything, but takes 4-8 weeks to get back approved so plan accordingly. Another option is temporally return the firearm to the title I configuration and then you can freely travel across state lines (again know local state laws for title 1 firearms). ATF 41f goes into effect on July 13th, 2016. First off any form “post marked” prior to July13th will be subject to the current requirements. Any form post marked July 13th or after must follow the new requirements. There was originally language in 41f about a 2 year grandfather window, but it seems the ATF has changed their minds and basically we should expect July 13th is the hard cut off for the switch to new requirements. Prior to July 13th and the 41f changes with a trust you send in the forms and list yourself as the trustor/trustee of the trust and sign. Nothing else is provided. After July 13th and when 41f goes into effect everyone listed as a trustor/trustee on the trust will be considered a “responsible party”. As such they would need to have a responsible party questionnaire completed and include passport photos and fingerprint cards. Finally a copy of the form being submitted must be sent to the local PD. There is no local PD approval required for either trust or individual applications, only notification. What if I want to sell my SBR? If you are selling your SBR to another resident in the same state then you can do a person to person Form 4 transfer. Doing so forfeits your original $200 NFA tax stamp, and the buyer would pay for a new $200 stamp to transfer to their individual or trust. The original owner of the SBR would retain possession until the new Form 4 stamp is approved and delivered. If you want to sell a NFA item to someone outside of state which you reside then you would then need to pay for a Form 4 transfer to a FFL/SOT in the buyer’s state. Then the FFL/SOT will complete another Form 4 to transfer it to the buyer. Thus requiring two $200 NFA tax stamps to complete the transfer for out of state buyers. Another option is return the firearm to a title I state. Then send a notification to the ATF to have the firearm removed from the NFA registry. You forfeit your $200 stamp doing so, however then you can sell your firearm through the normal private party transfer process per your local state laws. WA State SBR bill SB 6165, what does this change? The original SBR bill SB 5956 passed in 2014. However it lacked language that allowed a resident of WA to manufacture a SBR, it only allowed possession of an already created SBR. Hundreds of people successfully obtained approved Form 1 stamps from the ATF for over a year until the ATF discovered they should not be approving them. All Form 1 SBR applications stopped until the WA state law could be revised. SB 6165 fixes this issue and specifically says “Manufacture, own, buy, sell, loan, furnish, transport, or have in possession or under control” which basically now covers all aspects of creating and owning a SBR in the state of WA. SB 6165 was signed by the governor on April 1st, 2016 and goes into effect on June 9th, 2016. This means WA state residents can once again submit electronic or paper Form 1 to manufacture a SBR starting on June 9th. 2016.